Neon Tetra With Blood Blister? Discussion in 'Freshwater Fish Disease' started by runningslow, Apr 18, 2017. While doing a water change today, I noticed these red raised bumps on the right side of one of my tetras. This particular fish also has a small red mark, possibly an abrasion on its left side near its tail. Also its left gill is bright red, but it has been that way since I brought it home from a LFS about 6 months ago. What are these new bumps? Injury? Parasites? Sore? Anyone? I'd really like some input. I'll probably eithanize if it doesn't approve in the next few days, but my concern is over whether or not my other fish are in danger. I haven't checked on it since yesterday, but it was pretty much the same. Do you have a Quarantine Tank you could use? Any other symptoms? Any other fish having issues? What other fish are in the tank? Have you seen/suspect any bullying? Is the fish still eating/pooping normally? I'm not sure who to tag, so hopefully this will bump the post, too, and someone can take a look at that red spot! No other symptoms. Its behavior has been pretty normal. No bullying from other fish that I've seen, aside from some aggression between the neons. Its a 20 gal long. Parameters are 0,0,20. I keep it at 75F. Other fish in the tank are a Bolivian Ram, Dwarf Gourami, Hasbrosus Cories and a couple Otos. I could move it to quarantine if that's the step I need to take, though frankly, my concern isn't over saving it and more about making sure the rest of my tank is safe. I'd really like some opinions as to what this is? Injury? Parasite? Regardless, as of yesterday it would appear to be healing. Bumps are not as pronounced and look more white than red. I also watched it eat and it was swimming just fine. No one else in the tank shows any signs of being sick. I'm not sure if white is a good thing - I'm still very much a newbie, so I don't want to guess at diagnosis, but I don't know if that could mean a fungus or some other kind of infection. Let's try a tag on @CindiL? Hi, sorry your thread was missed. I try and get on every day but miss some here and there. Do you have an updated pic of it now that its turning white? It looked like an injury of some sort. It was under the skin right? not like a sore sitting on top? These pictures are from last night. Took them... forgot to post them. (The camera on my phone is terrible for anything except bright daylight stuff, so I take pictures with my wife's phone, wait for them to upload to Dropbox, then download to my phone to post. Another concern I now have after watching it last night is that it would appear its tail is drooping... for lack of a better word. Again, I'm not in any way an authority on any of this, but the only two things I know of that cause a bent spine are Fish TB or Neon Tetra Disease... both sound really bad, and would be cause to quarantine the sick fish (even if you don't care to save it, maybe to figure out what is going on so you can still save the others). Maybe read a bit about those to see what you think? Though I'd definitely feel much better to get @CindiL giving you her diagnosis. The bent spine alone would not make me think NTD but I agree that its probably a good idea to get this one out of the tank and into a QT as it could be TB. I guess the seemingly missing scales on the right side, the weird blister like things on the left, and curved tail might suggest TB. I'll get it out as soon as I can, but that probably won't be until this evening. I have a tank available for QT, but is it worth trying to save the fish if this is TB? Regardless of this fish's fate, are there any precautionary steps I may want to take with the main tank? At this point I think just a watch and wait is about all you can do because TB isn't really treatable (if thats what it is since we're not sure). If you see other symptoms that might indicate some type of bacteria then it would be worth treating. in my opinion a fish with TB woukd look "wasted" in a short period of time. This fish looks too healthy for lot of diseases. But what is is ??? RE: the red gill on the left side, that looks like a gill cover is missing and what you're seeing is the actual gill itself underneath. I agree with DoubleDutch. I had a fish with TB. It was always noticeably smaller than the others, then muscle wasting kicked in. Once the spin curved, I euthanized. It came home from the LFS with the missing gill cover, since it seemed otherwise fine. I didn't really think much of it and that was about 6 months ago. Now, the fish in question was euthanized last night. I took one last picture last night to hopefully shed some more light on the situation. As I've said before, I'm not overly concerned about one neon tetra. I do however want to be certain that the rest of my stock is going to be okay. 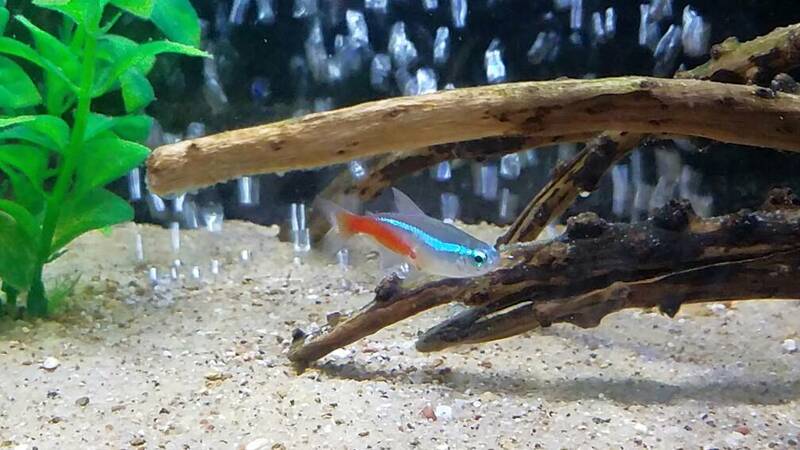 Should I Get A Neon Tetra? Is This Normal Behavior For Neon Tetras?